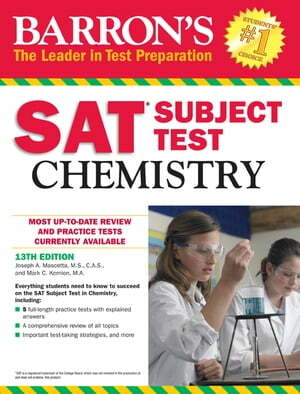 Collins Booksellers - Barron's SAT Subject Test: Chemistry, 13th Edition by Joseph A. Mascetta M.S. & Mark Kernion M.A., 9781438068541. Buy this book online. by Joseph A. Mascetta M.S. & Mark Kernion M.A. Both teachers and test-taking students have praised earlier editions of this manual for its wealth of well-organized detail. The manual can be purchased alone or with an optional CD-ROM that presents two additional full-length practice exams with automatic scoring and fully explained answers.